Creation, organization, commanders, actions, particularities and the end of the 1st SS Panzer Division Leibstandarte-SS-Adolf Hitler. Junior officer followed by soldiers of LAH during the adavnce in the West, May 1940. The Leibstandarte had its origins in the bodyguard of Hitler, which was created as SS-Stabswache Berlin in March 1933. The official name changed several times before the unit became the ‘Leibstandarte Adolf Hitler’ in November 1933. 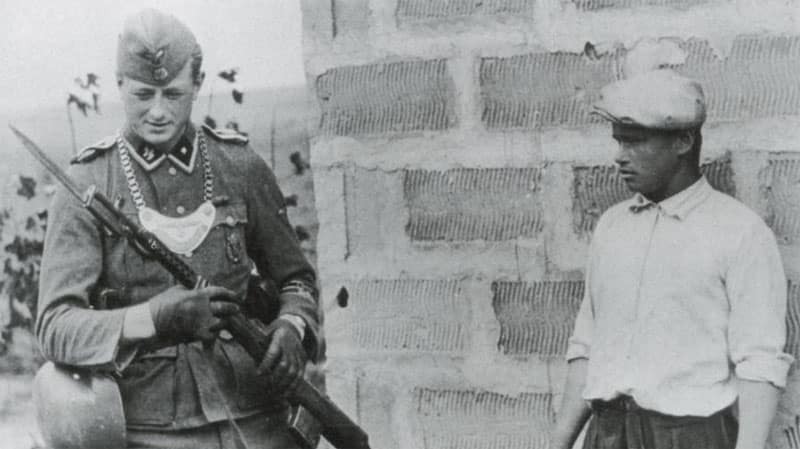 In contrast to most other German units, which had a certain region for recruitment, the regiment received his personel from all over Germany and only the physically best candidates were accepted. 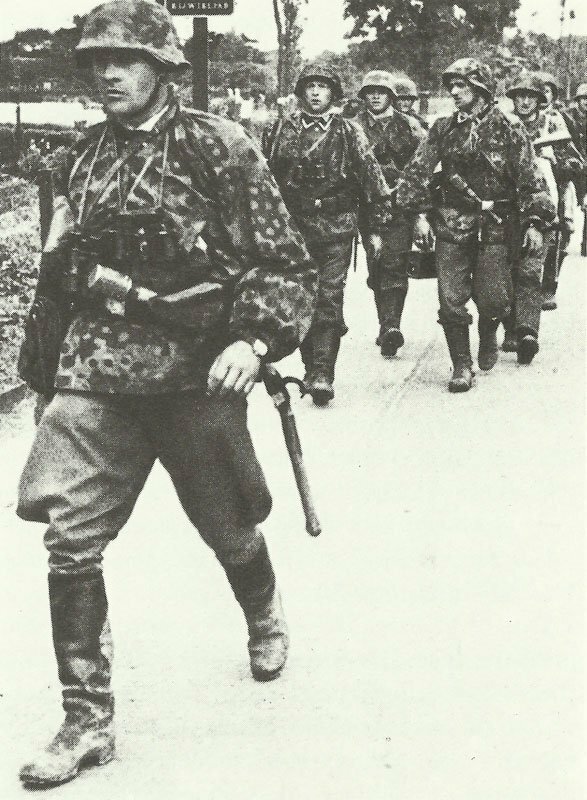 At the end of 1934, the Leibstandarte was expanded into a motorized infantry regiment. On 20 August 1939 mobilized as Leibstandarte SS-A.H. (mot). In March 1940, an artillery battalion was added to the regiment as the first step of the permanent expansion of this unit. Until Operation Barbarossa the unit was increased to brigade strength with under 11.000 men and was part of the Army Group South. Formed on 15 July 1942 in north-western France as SS-Panzer-Grenadier Division Leibstandarte Adolf Hitler (in short: LSSAH or LAH), which was previously formed at the end of 1940 as a strong Brigade and mobilized on 20th August 1939 as Leibstandarte SS-A.H. (mot). This major motorized formation, particular as early as late summer of 1942 a Panzer Division, was renamed on 22 October 1943 as 1st SS Panzer Division LSSAH. In mid-August 1940 strengthened to Brigade (mot.) LSSAH, the staff of the LSSAH Brigade (mot) had available at March 1941 before the Balkan Campaign: Three infantry battalions (mot.) and 13 – 18 coys (including engineers coy); regiment staff with I and II Artillery detachment (mot.Zug); Reconnaissance Battalion (mot.) LSSAH; Pioneer Battalion (mot.) LSSAH with three engineer coys/mot; Signals Abteilung (mot.). Furthermore, in June 1941, the IV (lnf.Btl / mot..; V. (heavy arms) Battalion and Abt Schönberger (staff with Sturmgeschütz coy (assault guns) and anti-tank coy with self-propelled guns); Anti-aircraft Abteilung (mot.) LSSAH (three mixed medium, one 88-mm Flak battery) and supply, medical service and repairing units of the ‘Commander of the Supply troops’ (while 2 medical coy, supply coy 1-8, motorized garage coy). SS Panzer Regiment 1 was reclassified as of October 1942 and reorganized in February 1942 in Wildflecken/Senne Camp from SS Pz.Abt.1 (formed from strains of Sturmgesch.Batterie LAH and m.Pz.Jg.-Kp. (Sfl.) LAH). SS Armoured Reconnaissance Battalion 1 was re-formed in the autumn of 1940 from the establishment of AA. (mot) LAH, and raised to six Pz.Aufkl.Kompanien (tank reconnaissance coy) until early 1943. SS-Sturmgesch.Abt. 1 (assault gun Abteilung) was formed from the summer of 1942 (three batteries). III. / SS-Panzer-Grenadier Regiment. 2 LSSAH (gp) was equipped in mid-November 1942 as SPW battalion (with armoured half-track personnel carriers), II. (Gp) 1 Pz.AR. 1 LSSAH received in April 1943 18 Pz.Haubitzen (Sfl. ; self-propelled artillery). 2 motorized infantry regiments (one with APCs), each with 3 battalions (instead of 2 as in army formations). 1 Panzer regiment (10 companies, one heavy company with Tiger tanks; TOE strength 1944 each 12 tanks), 1 battalion of 18 assault guns StuG 40, 1 anti-tank coy of 14 (1944:12) self-propelled guns, 18 self-propelled artillery guns Hummel. A military policeman from LSSAH is examing an AVS Model 36 rifle captured from this Soviet partisan . There is no doubt that this photo was the last one taken of this Russian men. The Brigade or SS-Division (mot.) LSSAH was a successful ‘fast unit’ since the French campaign in 1940. From a motorized infantry regiment in September 1939 it increased to a full and strong Panzer Division, like the Inf.Rgt. (mot.) ‘Grossdeutschland’ and Regiment (mot. )’ General Göring ‘. It was almost always used on the eastern and western front at the focal points of the battles. The Division was – like all mobile divisions of the Waffen-SS – stronger than the normal Panzer divisions of the Wehrmacht. The LSSAH received ‘more new material’, because – as ‘GD’ and ‘Hermann Göring’ – lost more often armored vehicles and weapons through wear and enemy action in weeklong hard combat missions in the hotspots of the battle. The Command office and Supplementary Office of the Waffen-SS was from the summer of 1944 not more able to replace the huge bloody losses by replacements of volunteers; and LSSAH was therefore increasingly filled up by members of the Luftwaffe and Navy, as well as ethnic Germans from Southeastern Europe. 1st SS Panzer Division LSSAH surrendered on from May 8-9, 1945 in the area west of Erfa/southwest of Linz to US forces (mass of their leaders and sub-leaders interned until 1950). The members of the division were not handed over to the Red Army in Austria, like from SS-Division ‘Totenkopf’ or ‘FGD/GD’.